Discussion in 'The Small Company Luthiers' started by snoopy1@isoc.ne, Feb 6, 2012. This will have a birdseye neck and board along with birdseye rings and bobins Ect.. I think that I've got it's brother!!!! Those are both incredible bookmatches!! Beautiful. Holy crap. You could swim in both those waves. 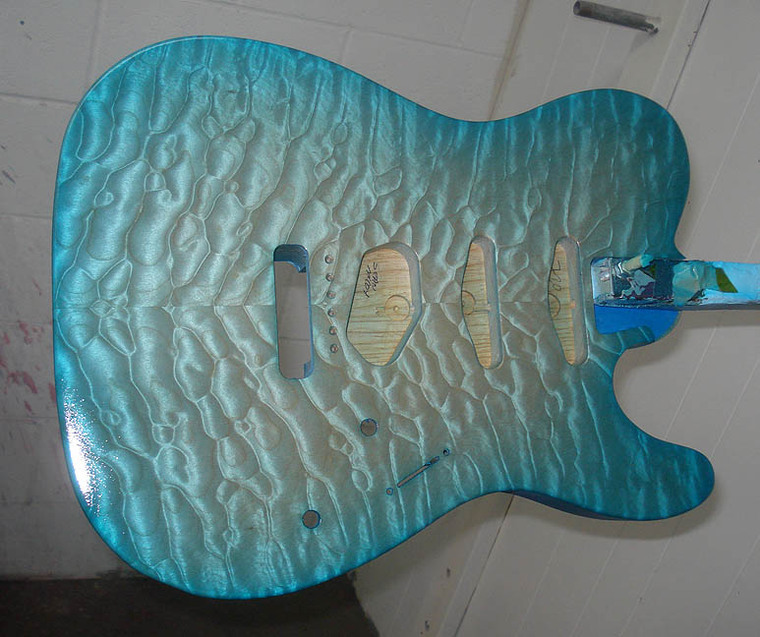 Nicest blueburst I have ever seen. Wow! Outstanding work as always. Very different quilts, but the color is very close; both are awesome. I love Ron's guitars, therefore I love these. Damn Mike, you couldn't ask Ron to find you a nice top? That is KILLER man, looking forward to seeing the rest of the pieces to this one! I love how ALL of Ron's figured tops are simply the bomb. No trashy cross-grained stuff like you see all the time - even with other very good boutique makers (who will remain nameless here). I don't usually go for quilt but I'd rock those 8 days a week. Nice!!! Thanks for all the kind words. I love everyone of my Thorns, they are very special guitars to me. I love that color. That's gonna look fantastic with birdseye. Silly warm-weather Californians with no appreciation for the beauty of the tundra. I believe this is Sean color he let me have. My next one will be like this but with a Forrest green. what he said! i almost thought it was a one piece!! !